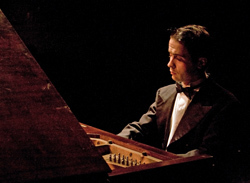 The Mauch Chunk Opera House presents piano virtuoso Giorgi Latsabidze Sunday, May 13 (Mother’s Day) at 5 PM. The concert will be performed on the Opera House’s remarkable 1898 Chickering 9-foot grand piano, recently refurbished and possessing a distinctive, warm sound. Dine in Jim Thorpe for 10% – 20% less, before or after the show, using the Opera House Performance Card. Here’s how to get it! Giorgi Latsabidze grew up in the Soviet Republic of Georgia, where his aptitude for the piano was almost immediately apparent. Today, at age thirty one, he is considered to be one of the significant pianists of his generation, having performed an ambitious concert schedule throughout Europe, Asia, and more recently, the United States. In 2005, Latsabidze gave solo concerts throughout Austria, following which Governor Franz Voves of Styria, Austria invited him to perform a series of private salon concerts over the coming three consecutive years. He mesmerizes concertgoers and critics, who have been unanimous in their praise: “Today’s piano playing at its very best” (Salzburger Nachrichten, Austria), “One of the world-class virtuosi of the 21st century.” (Le Monde, Paris). Latsabidze will perform a program of preludes by Chopin, Debussy and Rachmaninoff. View a terrific video of Mr. Latsabidze here. To hear brilliant pianists perform at the Opera House is a special treat. The facility was built in 1881 by Philadelphia architect Addison Hutton, who paid special attention to the acoustics of the building. The Chickering grand piano itself is very rare and possesses a sound that has attracted the affection of renowned technician Larry Trischetta, who also maintains and refurbishes pianos at the Kimmel Center in Scranton and for the Reading Jazz Festival. Tickets are on sale online for only $20 or they can be obtained at SoundCheck Records in downtown Jim Thorpe by visiting them or calling (570) 325-4009. The Opera House Box Office can be reached at (570) 325-0249. Latsabidze will perform a program of preludes by Chopin, Debussy and Rachmaninoff. Click here for the program.